Enterprise Mobility!! I know this topic is not new for you and we all are aware about it. So what’s new I am going to share about enterprise mobility through this piece of content? I am just sharing some spicy technology and trends which will definitely help your business reach a new level. So what Enterprise Mobility exactly is? Enterprise mobility solutions is a bunch of many processes such as technology used, managing mobile devices, wireless networks, & other mobile computing requirements in a business context. Entеrрrіѕе mobility is being looked upon аѕ a perfect tool for improving internal communication, collaboration and productivity. The power to connect from anywhere anytime, give employees flexibility which help them manage their personal and professional life smoothly. 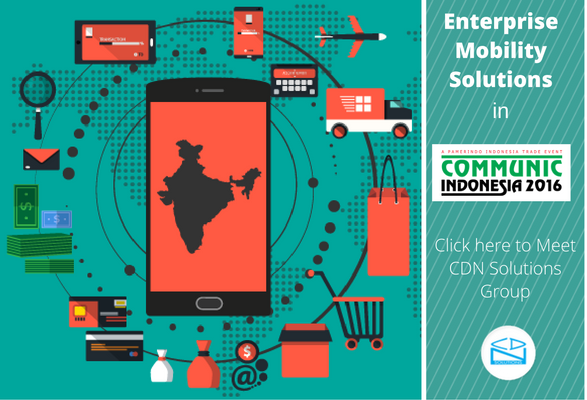 So what you are waiting for, contact us here to build your enterprise mobility solution right now to reduce the cost & improve the productivity of your Enterprise.You can also meet us in ICT Communic Indonesia 2016. This year for the first time we are exhibiting in Communic Indonesia 2016 fair. We all are very excited about this event because we will showcase some of our mind blowing projects related to enterprise mobility solutions. You can meet us at our stand A-1306 in JIExpo Hall, Jakarta, Indonesia during the event i.e. from 31st Aug – 3rd Sept 2016. We are also comfortable sharing free e-invite with you in case you dont have one. Contact us here to avail your free passes for Communic Indonesia 2016. Main topics to focus for this event are; Augmented Reality, Business Analytics, Business Intelligence, Content Management, CRM, ERP, eGovernment, Enterprise Applications, Enterprise Mobility Solutions, Location Based Solutions / GPS / Navigation, Managed Services, M-Commerce, M-Health, Mobile Content and Applications, Mobile Games, Multimedia Communications and Services, Portal Software, Sales Force Management, Smart Card Products and Services, Social Media / Social Networking, Web Services, Outsourcing Services, Services and Consulting, Smartphones and Devices, System Integration, Software Tools, 3D, Applications Development, Messaging Solutions, Bluetooth Technology, GSM/GPRS, Machine to Machine (M2M), RFID. So lets talk about in deep for Enterprise Mobility Solutions. Our enterprise mobility package is not restrict to traditional methodologies. Security in Our Enterprise Mobility Solutions: – The enterprise mobility solutions developed under CDN Solutions Group are malware free. Our skilled mobile app developers are aware of all security threats and take care of this issue while developing any mobile app. So what you are waiting for? Contact us right now to meet us in Communic Indonesia 2016 and take advantage of our innovative services wrapped up with new flavor of technologies. And dont miss the chance to collect your free passes to attend this event. Feel free to send us a quote for availing passes or fix a meeting with us in Communic Indonesia 2016.